The House Speaker says that the pardon diminishes the responsibility that law enforcement officials have to respect the rights of Americans. Arpaio—a former sheriff in Maricopa County, Arizona—was convicted last month on charges that stemmed from contravening a court order related to a racial profiling case, the outlet said. He was slated to be sentenced for criminal contempt charges in October. According to Ryan’s spokesman Doug Andres, the House speaker believes that Arpaio’s actions don’t align with the responsibility that law enforcement officials have to respect the rights of individuals. “The Speaker does not agree with this decision. Law enforcement officials have a special responsibility to respect the rights of everyone in the United States. We should not allow anyone to believe that responsibility is diminished by this pardon,” Andres said, according to CNN. Paul Ryan isn’t the only Republican who condemned Arpaio’s pardon. Sen. John McCain denounced Trump’s decision as well. “The President has the authority to make this pardon, but doing so at this time undermines his claim for the respect of rule of law, as Mr. Arpaio has shown no remorse for his actions,” McCain said in a statement, according to CNN. Sens. Jeff Flake and Dianne Feinstein also disapproved of Arpaio’s pardon. 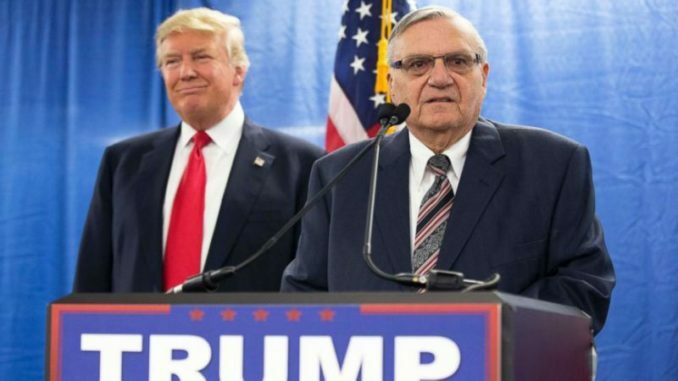 Arpaio says his pardon shows that Trump is a “big supporter of law enforcement,” the outlet stated. The Arpaio controversy is one of the many issues that Trump and other Republicans are feuding over. CNN reported that over the last few weeks Trump has bumped heads with Senate Majority Leader Mitch McConnell over his failure to increase the debt ceiling and dismantle parts of the Affordable Care Act.